Our philosophy is to welcome all our customers as close friends. 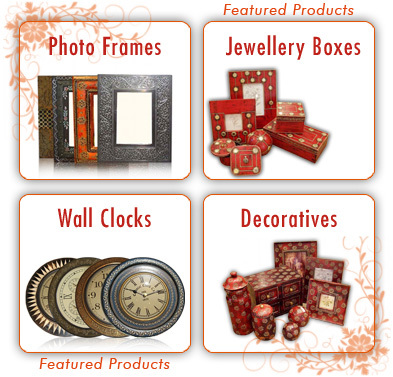 We take great joy in helping you find best of Handicrafts and Giftware from INDIA which are developed with help of our well experienced design team. ACN Exports is a leading Manufacturer, Exporter and Supplier of Wooden and Metal Crafts, Gift Articles, Wooden Furniture in wide variety. ACN Exports is specialized in manufacturing and exporting Indian Handicraft Items, Decorative Gift Articles, Garden / Classic Furniture, Glassware, Home Furnishings, Textiles, Scarves, & Metal items and much more. In today's competitive marketplace, Quality with Service and Customer's satisfaction is imperative. The customers not only want to have products which are appealing, and have a unique and aesthetic sense, but also products, which are also Eco-friendly and Durable. Committed to above ACN Exports provides it's customers with high quality materials at competitive prices with dependable service. ACN Exports is part of the ACN group of companies, catering Information Technology and related services to Major clientele from USA and UK. The group employs over 500 personnel worldwide. To provide the most extensive and interesting range of Indian handicrafts, with something within everyone's price range; and following a strict quality control.